When I started pottery, I only got to use the wheels at my evening classes once a week. There were 4 wheels and 12 students so you can imagine how long I got to spend practising my throwing. It was soon clear that if I wanted to progress my skills I needed my own wheel. I now have two wheels in my studio, I have a Cowley Wheel circa 1980 which I have used for approx 12 years. And I also have my new Skutt Professional Wheel. Wheels are generally not cheap and there are a lot of different models on the market, it’s important to get the right one for you but with all the choice it can be a little overwhelming. To choose new or second hand? I was lucky enough to buy my Cowley for £200 second hand from a potter that was closing down his studio to become a video artist (that price is practically unheard of nowadays. ) Potters tend to hold on to their wheels (I know I will likely never sell either of mine) this means not many of them come up for sale, so you could be waiting a long time to get your muddy hands on one. Also wheels tend to hold their value - as pottery is making something of a comeback you may find yourself in a bidding war on eBay pushing the prices up beyond what the wheel is probably worth. Also, a lot of potter’s just starting out on their clay adventure may not know what questions to ask the seller in order to understand a wheel’s condition. A friend of mine recently bought a wheel for £500 - it turned out to have a very slight ‘wobble’ now this didn’t turn out to be a big deal but she didn't know that when she bought it and it may have made her think twice about buying it if she had. Getting a wheel which is not 100% can mean your throwing is set back and can really knock your confidence. Wheels are often quite big, heavy and are difficult to move. This might sound trivial but it’s important - unless you have van and a couple of willing, strong volunteers you might find you have difficulties transporting that wheel you have just won on eBay from say, Glasgow to Cornwall. One of the joys of investing in a new wheel is that delivery is organised for you via pallet, no stress about how you are going to fit the wheel into your Nissan Micra. Shapes, sizes, and brands - most pottery suppliers such as Cromartie Hobby Craft (where my Skutt wheel came from) will welcome you to come and sit at their wheels in the showroom and try the different models before you buy (as long as you don’t try and make a dinner set whilst you are there;-). This will ensure you get the right fit for you. Your Throwing Position: My Cowley is a sit onwheel, it comes with a seat attached - as I am 5ft 1” I have to sit on a cushion when I am throwing on this wheel. My Skutt wheel has the added option of fully adjustable legs so I can adjust the wheel to suit my height and preferred throwing position. I can even even stand whilst throwing which is great for those who may suffer from a back problems. The pedal on my Skutt wheel is separate from the body of the wheel and is therefore movable so you can adjust your leg position, the pedal on my Cowley is fixed. What its made from: Due to its age the plastic on my old wheel’s splash pan has degraded and is now very fragile (it has cracks around the edges which traps my arm hairs during throwing -OUCH! :-/ ) this is a common problem with older second hand wheels. My new wheel is solid cast aluminium with 1/8”-thick steel legs, the splash pan will never get brittle. This wheel could survive a zombie apocalypse. What you want to make: Think about what you want to use your wheel for. My Skutt wheel comes with 1 Horse Power, my 2nd hand wheel is only 1/4 HP ( which means if I put enough pressure on the wheel head I can slow it down) There is no slowing down the Skutt, with it’s 14 inch wheel head and best in it’s class motor it can centre 100lbs of clay without breaking a sweat. Hobby potter or full-time gig? Are you an occasional thrower or are you looking to start your own business? Will you always be throwing small items or are you likely to want to throw larger forms one day? 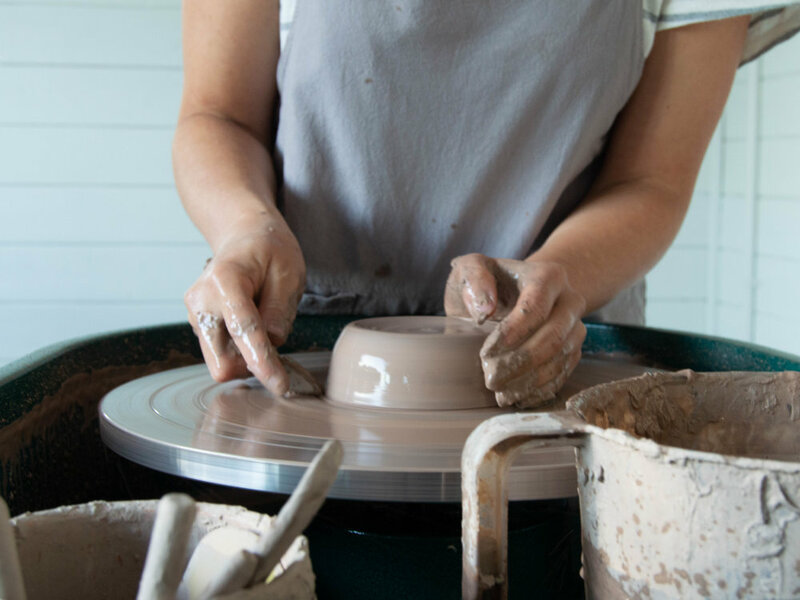 If you think you might want pottery to become your side hustle or even a full time job one day it would be worth investing in the right wheel now rather than having to pay twice upgrading to a better wheel later. A word of warning: During my research for this blog I have noticed there are a few unbranded new wheels for sale for around £250 on some online market places - I have no personal experience of these wheels but I would urge caution- pottery wheels need to undergo rigorous testing for durability, functionality and safety. Wheel brands have tried and tested their products for often years before releasing them onto the market. More often than not pottery brands have a long history making products for the ceramics industry, they have done years of research alongside potters in order to provide the best possible products. That’s essentially what you are paying for when you buy from a brand: the reputation. Reputable wheel stockists also provide customer service and are happy to offer advice on how to get the best out of your wheel, maintenance and how best to care for your wheel. I am not saying that these £250 wheels are no good, I haven’t tried one but that price tag suggests not a lot of testing or research has been done and there is no customer service in sight. It feels a little like someone saw an opportunity and decided to make a quick buck. That’s just my opinion. I hope this has been helpful - do let me know if you have any further tips to add - I’d love to hear them!